7 Now, based on the models given find your own images and write their descriptions. / Ahora, con base en los modelos dados incluya sus propias imágenes y escriba sus descripciones. 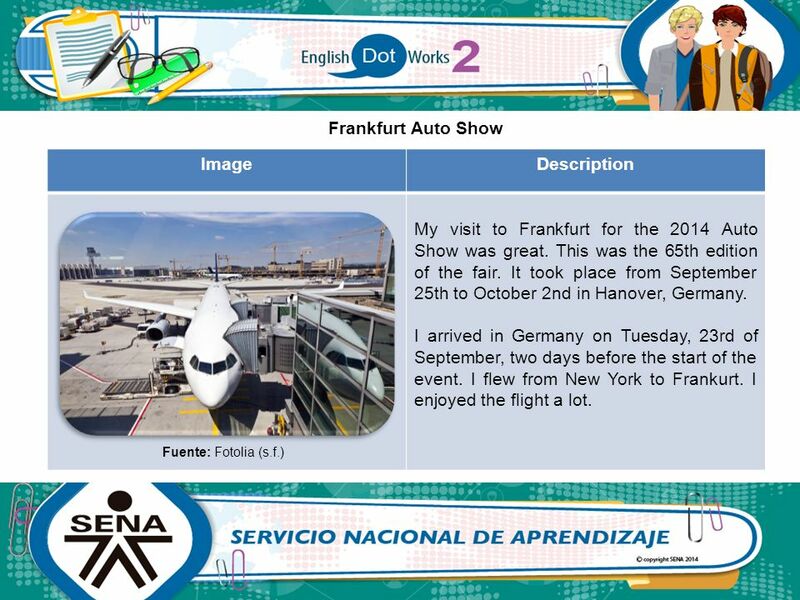 8 [ Your fair ] Image Description My visit to Corferias Bogota for the 2014 agroexpo fair was great. This was the 20th edition of the fair. It took place from July 9th to 20th in Bogota, Colombia. I arrived in Bogota on Thursday, 8th of july, one days before the start of the event. I flew from Cartagena to Bogota. The flight took 45 minutes. 9 [ Your fair ] Image Description I arrived at the exhibition center on Wednesday, which was the first day of the show. There were outdoor and indoor exhibitions and lot of visitors. I first visited the horses pavilion. There were several exhibitions by different horses. I enjoyed them all. The place was full of people because the horses were really amazing, there were horses of many places of world. 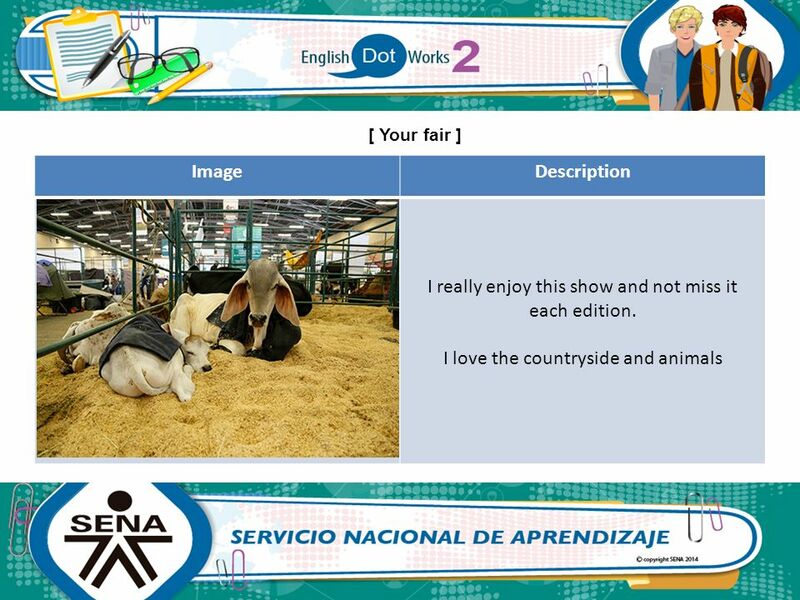 10 [ Your fair ] Image Description Then, I attended a presentation about the cattle. The exhibitors showed very beautiful specimens. These exhibition was very interesting too. They had a huge black bull that was very docile and I could touch it and it ate on my hand. 11 [ Your fair ] Image Description Before the end of the show, I had the opportunity to ride a horse of a very a race little known. I rode on the horse for 15 minutes. this was great, I was very happy on the horse, I felt like a horse rider true. 13 I really enjoy this show and not miss it each edition. 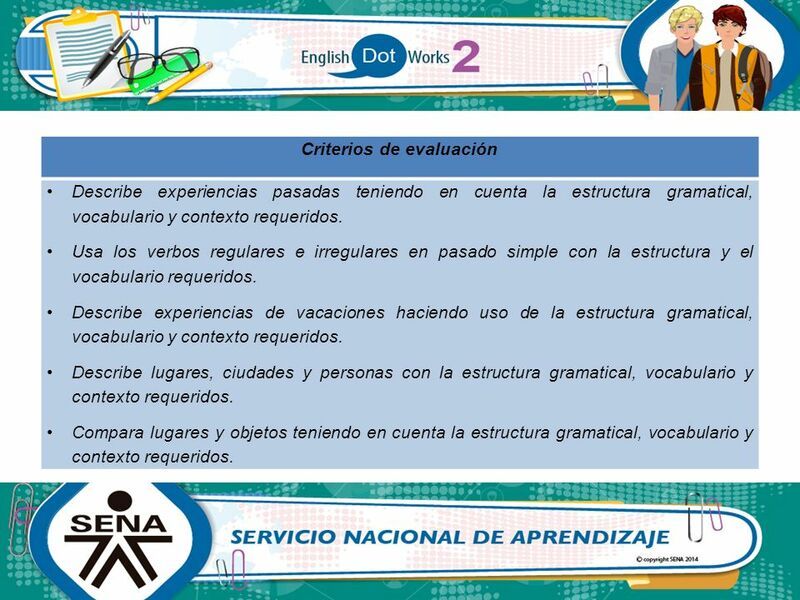 Describe experiencias pasadas teniendo en cuenta la estructura gramatical, vocabulario y contexto requeridos. Usa los verbos regulares e irregulares en pasado simple con la estructura y el vocabulario requeridos. Describe experiencias de vacaciones haciendo uso de la estructura gramatical, vocabulario y contexto requeridos. Describe lugares, ciudades y personas con la estructura gramatical, vocabulario y contexto requeridos. Compara lugares y objetos teniendo en cuenta la estructura gramatical, vocabulario y contexto requeridos. 15 Expresa deberes y obligaciones, teniendo en cuenta la estructura gramatical, vocabulario y contexto requeridos. Describe lugares, ciudades y países teniendo en cuenta el vocabulario y contexto requerido. Usa las preposiciones de movimiento con la estructura y el vocabulario requeridos. 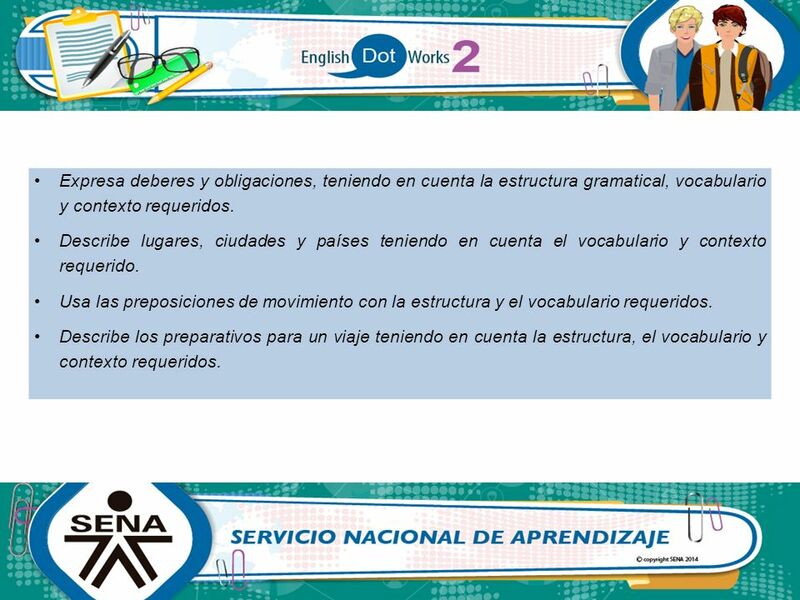 Describe los preparativos para un viaje teniendo en cuenta la estructura, el vocabulario y contexto requeridos. 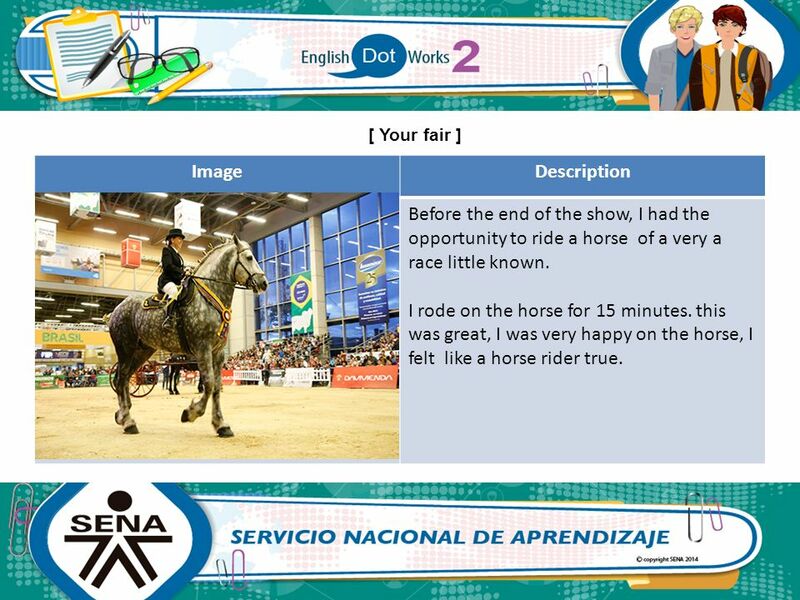 Descargar ppt "Stage 1: “My visit to the fair” / Etapa 1: “Mi visita a la feria”"
WALT: talking about dates and saying when your birthday is WILF: To be able to write & understand months and dates in Spanish to get to a Level 2 To be. Los días de la semana Days of the week. The Spanish PLUPERFECT TENSE What does this tense mean? How do I use haber for this tense? AIMS: To learn how to recognise regular and irregular pluperfect. La pregunta: ¿Cuál país del mundo hispanohablante está en África? ¿Cuál país del mundo hispanohablante está en Europa? ¿Cuál país del mundo hispanohablante. Study this picture for 1 minute. Try to remember as much as possible about it. Now tell your partner about the picture. Take it in turns to say something. El 22 de agosto La Tarea: E studia los apuntes de la Unidad 1 y Etapa 1 para describir eventos en el pasado. Leer sobre La Tomatina pp y contestar. Español 3 Hoy es jueves el 2 de enero de La Campana 1.¿Cómo era tu vacación? 2.¿Adónde fuiste? 3. ¿Qué hiciste? Contesta las preguntas. Usa el. Digital Photography: Selfie Slides Liliana Martinez 10/27/14 4b. Week 7 Spanish I Grade Week 7Do Now 1 Sunday, October 27th, 2014  Define in Spanish. You must write the English + the Spanish for full credit. MY WAY Frank Sinatra MARILYNMONROEMARILYNMONROE Ligue o som.